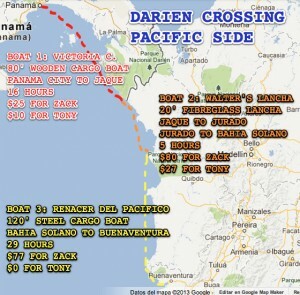 « Stage 7: Colombia and the Darien Gap AKA Operation: VICTORY LAP!!! 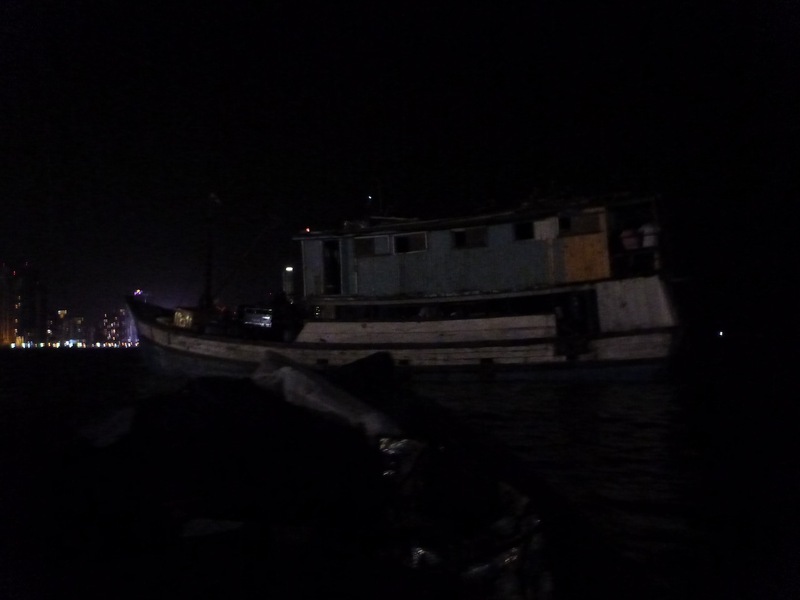 The outboard engine roared as we bounced across the dark waters reflecting the lights of Panama city. 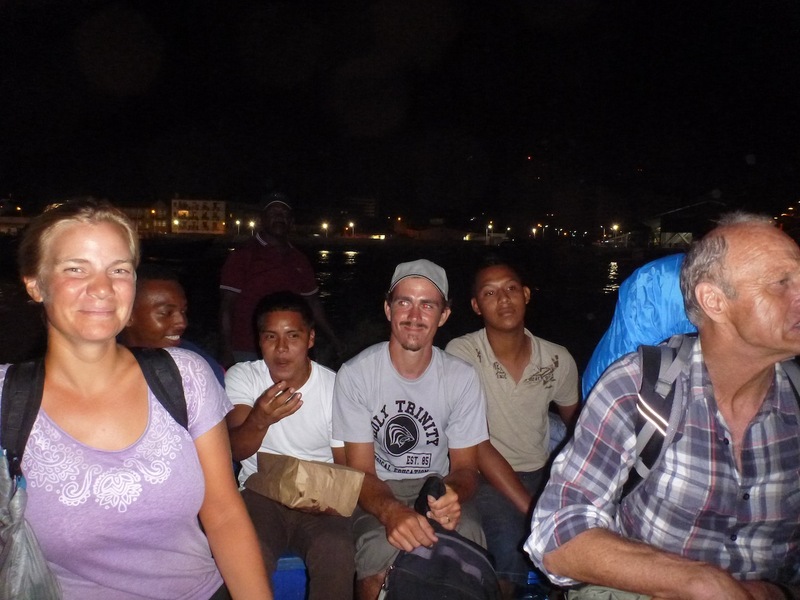 It was 8pm on a thursday night and we were in a small dinghy being taxied out to Victoria C. the cargo boat that would be our ride for the first leg of our journey into the Darien. With me was Ali, Glenn and Niels, and I looked back to see all three of them peering ahead into the dark, trying to catch the first glimpse of our boat. We had no idea what was waiting for us out there. On the Lancha in Panama city being shuttled out to the good ship Victoria C.
Earlier that day, Niels and I had gone down to the docks to purchase our tickets from the captain. 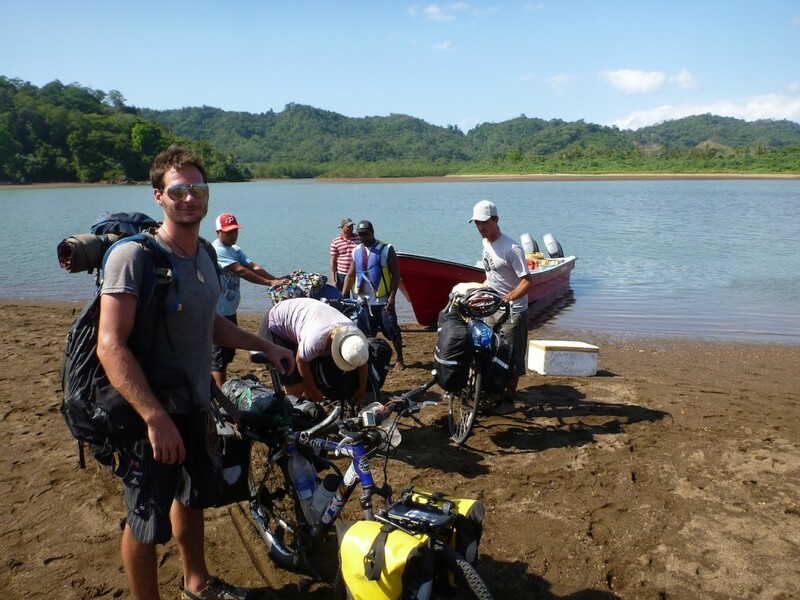 Our fare would be $25 per person, and after a brief discussion with the man in charge of the cargo, the bike would be an extra $10. $35 for passage all the way to Jaque, a small fishing village near the Colombian border?! It was almost too good to be true and as we left the cargo loading area we clung to our tickets as if afraid they would magically disappear. Later that afternoon, Ali, Glenn and I had come back with our loaded bicycles and given them over to an old grizzly man missing half his teeth who would be in charged of loading them onto the boat. He asked for $2 per bicycle. We hadn’t argued. “Is that our boat there?” Ally asked. I turned back and scanned the darkness ahead of us, looking for a large cargo ship of some type up ahead of us. I couldn’t see it. “It might be…” Glenn seconded. 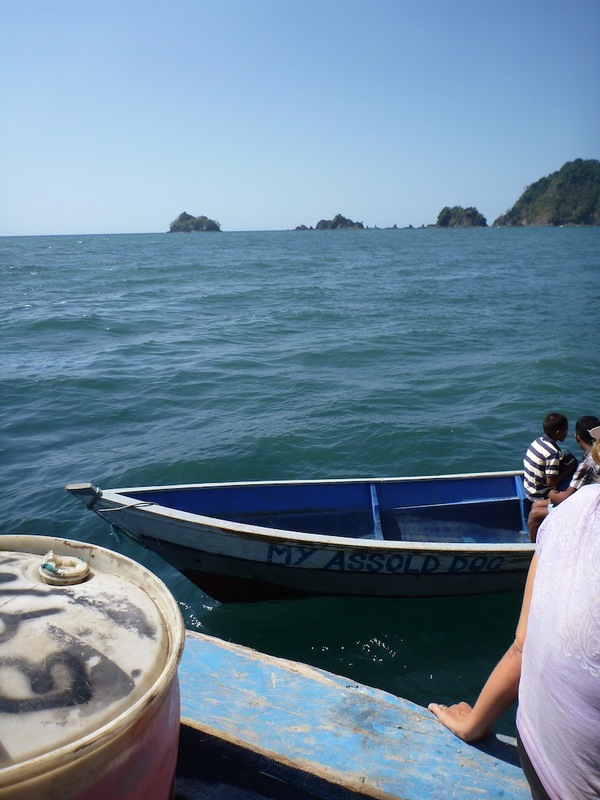 I looked again, but still couldn’t see it… unless it was… but no, that couldn’t be our boat… could it? “Yeah, it is, yeah, that must be our boat” Niels confirmed. Out of the darkness we could now make out a small wooden cargo boat, maybe 80 ft in length and covered with peeling paint. 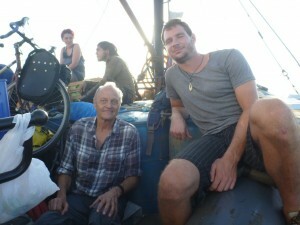 It reminded me of the boats that I’d see on TV in Australia, the ones carrying asylum seekers. 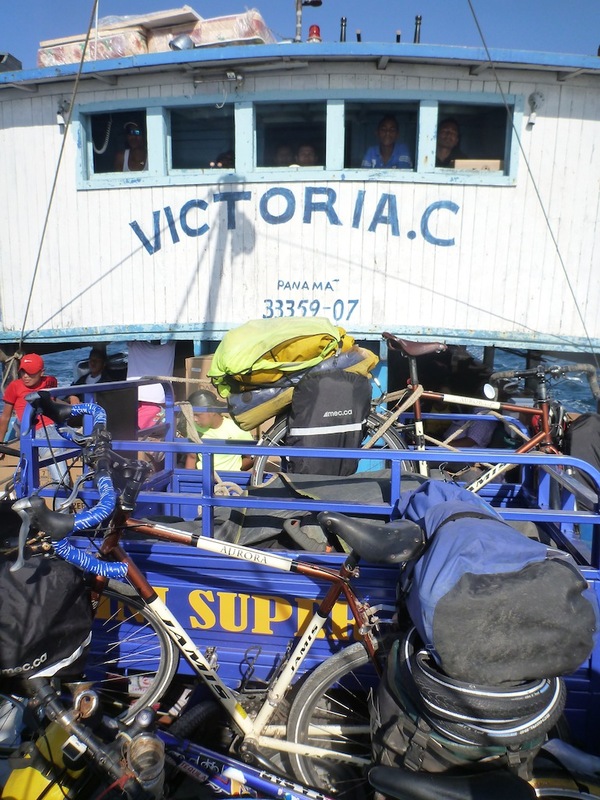 We were looking at the Victoria C.
Our lancha, which had already made 4 or 5 trips out to theVictoria, now pulled up for the last time alongside the heavily loaded boat. 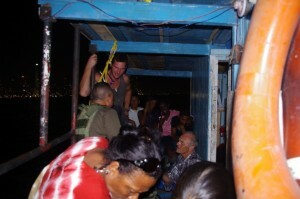 As we clambered up on board, the lower deck was absolute chaos with people and crew moving around everywhere in darkness, dragging luggage, stepping over old ladies and tripping on the rudder chains. We couldn’t move forward, we couldn’t move back, so we pushed our way to the steps leading up the upper deck like swimmers shooting for the surface. We popped up onto a small back balcony, just as rammed with people, but we all managed to find a place to squeeze into. Glenn disappeared somewhere in the direction of the steering house, Ally found a corner to squeeze into next to a couple of the guards, and Niels and I found a bit of floor space to sit down in at the top of the stairs we’d just come up. We were far from comfortable. To my left were five teenage school kids squeezed onto a bench for two and so I was half under and half sitting on a dozen feet. Above me to my right, sitting on the guardrail, was the two other guards, dressed in heavy boots and full camouflage and doing their best to not point their large machine guns at anyone, which was tough considering that the two mothers to Niels´ left had already spread out blankets across the middle of the walkway and put 4 babies to bed. Every time the guard closest to me shifted around, the barrel of his gun would graze my cheek or point worryingly at my collar bone. Niels passed me over a box of wine and I took a grateful swig before passing it back to him. “You know, I’m pretty used to being around guns these days, but I’m still not too chuffed about having one pointed at my neck.” I yelled at him over the sound of the engine. The Victoria would be the first boat of three for our Darien crossing. “Hopefully once we get moving and everyone settles down a bit more we will be able to find a more comfortable place! If not, I’m climbing up on the roof!” We had placed bets of the journey time and the estimates ranged from 16 to 24 hours, so a comfortable place to lie down would certainly be nice. Just then, the engine noise kicked up another notch and small wake began to appear behind us. The Victoria C. was on her way. It was a surreal moment being there squeezed into the back of that old junk of a boat whilst the city lights of Panama’s skyscrapers and high rises slowly drifted by. Out there were thousand dollar hotel rooms, million dollar apartments, and $300 bottles of champagne. Out there were casinos filled with people placing $50, $100, $200 bets and fancy bars filled with dressed-up businessmen paying $11 for a $1 scotch. 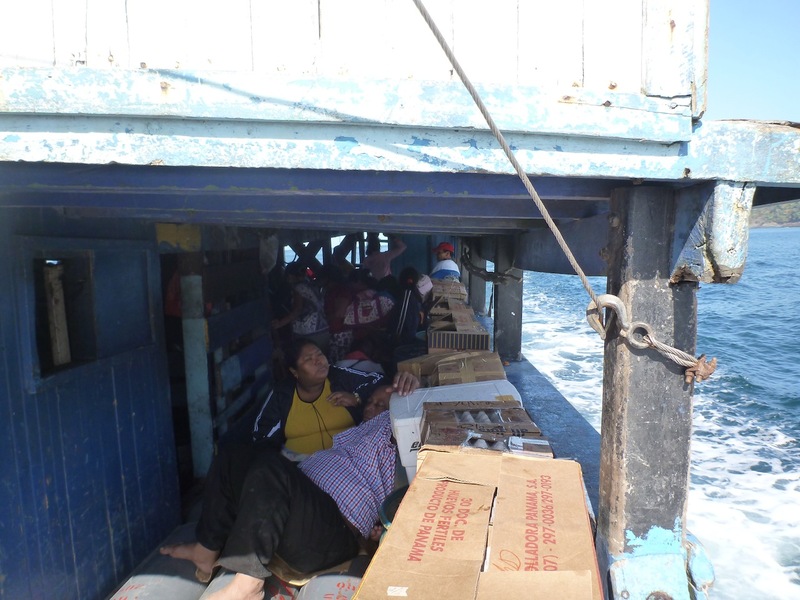 Meanwhile, onboard the Victoria C. we had 60 souls squeezed in like sardines on an old, slow, rickety boat headed for the Darien. Two very, very different worlds. As we began to leave the city lights behind, I chatted with the cheeky school kids to my left, split a banana with the guard to my right and shared the cheap box of wine with Niels across from me. I knew in that moment, as I shifted painfully to keep my legs from cramping up, that I was right where I wanted to be. And it had only cost me $25. squeezed in between barrels of petrol and a motorcycle. My bed was a couple of gas cylinders. I let out a long quiet groan before extracting myself from my sleeping bag so that I could go and take a piss over the side of the boat. As I watched my arc of urine splash into the Pacific Ocean I thought for the thousandth time this trip that it sure is convenient at times to be a man. 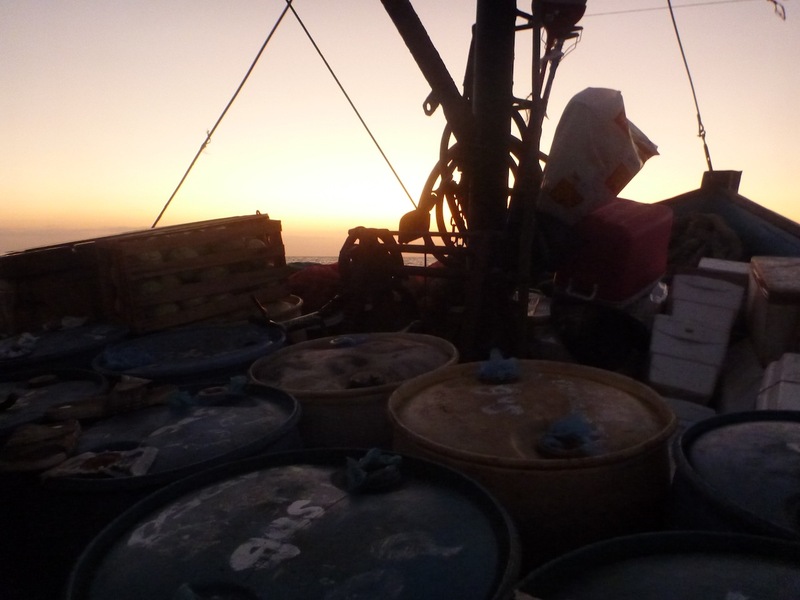 The Victoria had made good progress through the night and we were being blessed with clear weather and calm seas. She was now running along a wild verdant coast that rose up steeply from the ocean. There was nothing out here, nothing, and the only change in scenery over the next 5 hours would be the comings and goings of a few groups of dolphins. 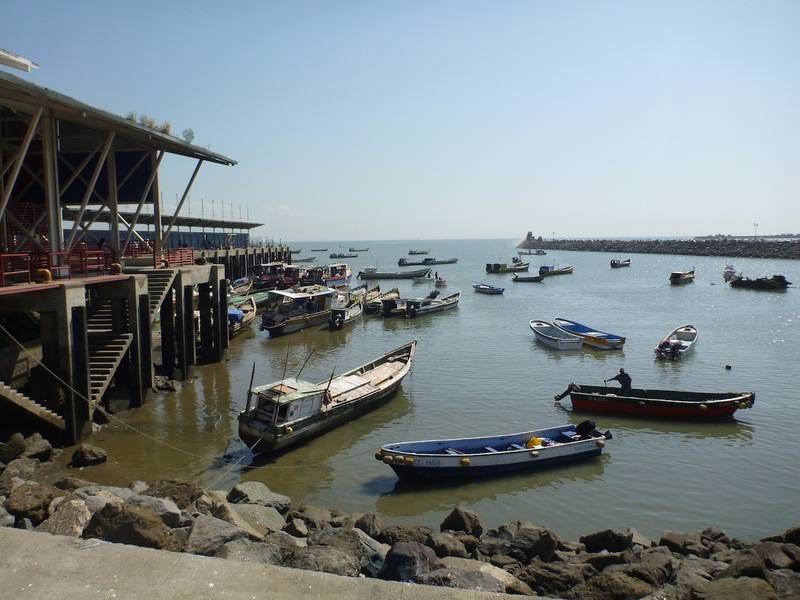 The first fishing village we came to was Playa Muerto (Death Beach), a small place that really needs a name change if they ever want to attract any tourists. As we passed by the quiet black-sand beach sprinkled with thatched huts, two lanchas raced out to meet us. 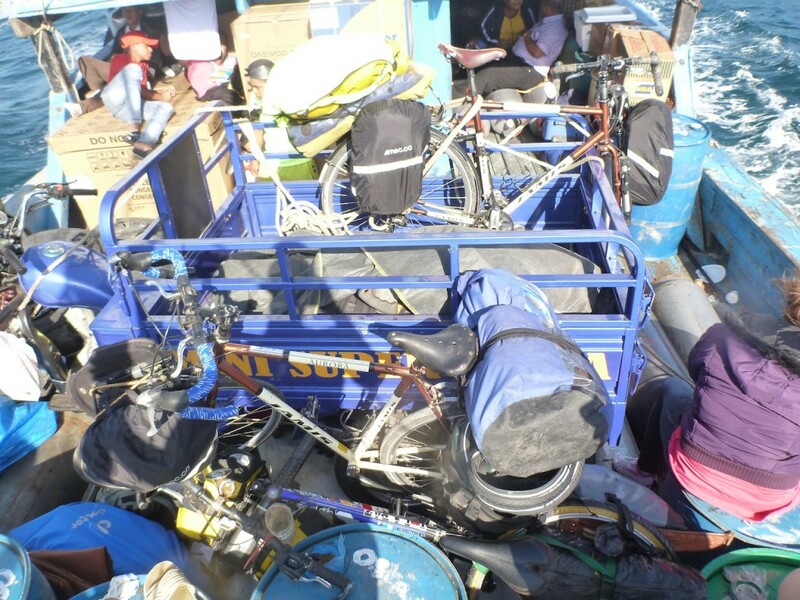 One was a powerful looking police boat with four massive outboard engines on the back – obviously designed to chase down drug runners – while the other was villagers who had come out to unload any passengers or cargo. 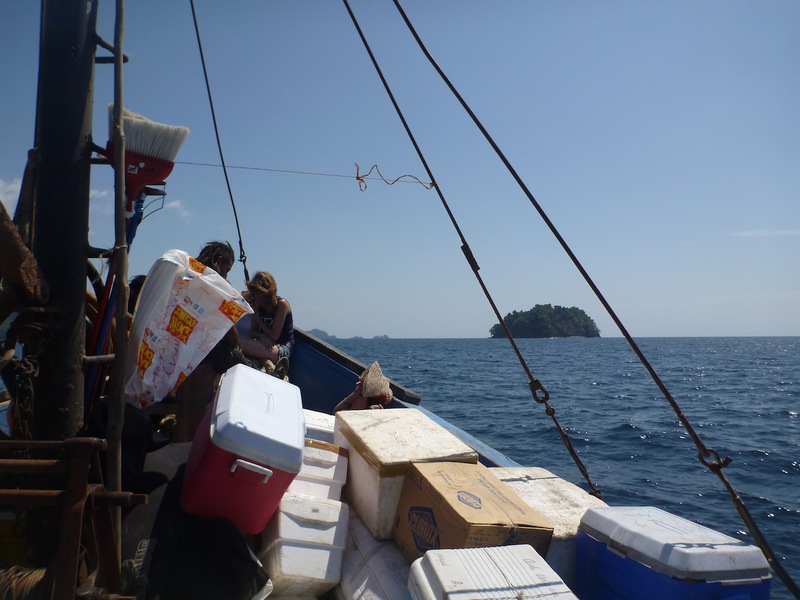 A young man with a Playa Muerto football jersey hopped on board and chatted with us saying that there was a small hotel in the village, but that we’d be stuck there for the week waiting for the next cargo boat unless we hired a lancha to deliver us to the next town. He said the cost would be around $200 dollars, to pay for the fuel. It was then that I first fully appreciated just how remote these villages were. 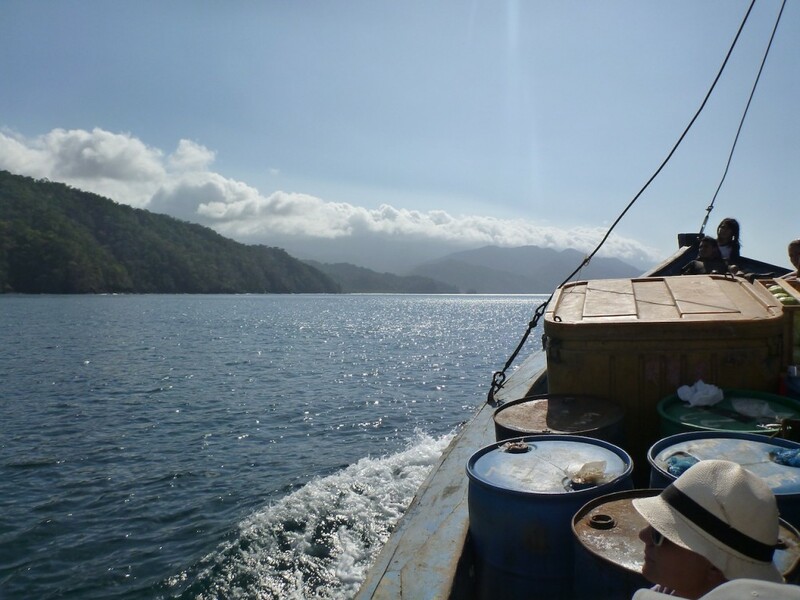 No roads, no airstrip, just one slow cargo boat each week and a prohibitively expensive fuel bill to drive your lancha to the next town. 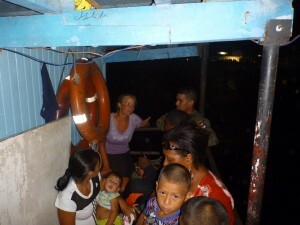 It was 12:30 pm when we finally arrived at Jaque, and a couple of lanchas braved the surf to come out and meet us. After a bit of a wrestling match we managed to get the three bicycles untangled and dropped over the side of the Victoria into one of the dinghies bobbing in the water below. 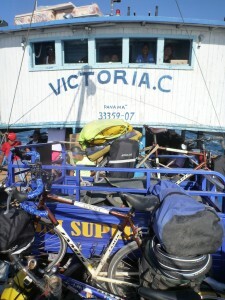 As we pulled away, we gave a wave to the Captain in the steering house and said goodbye to the good ship Victoria C. - the workhorse of the Darien - as she headed back west to the previous town of Puerto Piña to unload her heavy cargo of fridges, freezers, petrol, gas cylinders and motorcycles. 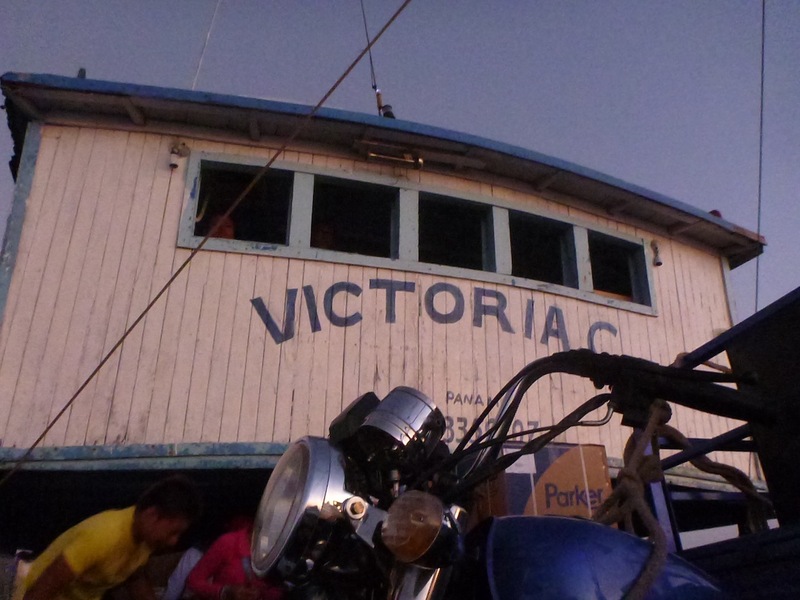 The Victoria C. leaves roughly once a week from the docks by the seafood market near Casco Antiguo in Panama City. Ask there for more information. It costs $25 for the journey to Jaque. Bring water and some food for the 16 to 24 hour journey. I hope you get a bunk. Immigration control is available (at the time of writing) in Jaque, but there are no banks or ATMs anywhere near here so be sure to bring enough cash to pay your way on to Bahia Solana. 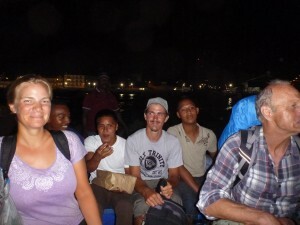 ($80) There is also a very basic hotel in Jaque ($5) to spend the night in if necessary and a place to use the internet.